Falooda is orignally a Persian recipe brought to India during the Mughal period. Since then a lot of variations of falooda are available in most fast food restaurants in India. It is a very cooling and filling but sweet drink. Falooda can be made from kesar syrup, with mango, figs, actually what ever you prefer. I have made the traditional falooda with rose syrup so hope you like it. 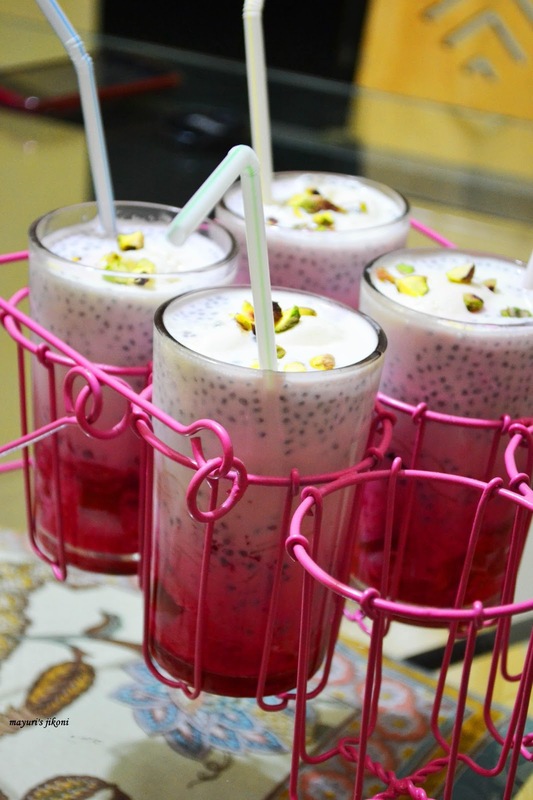 Falooda seeds or chia seeds are very tiny seeds packed with energy and omega 3. Most indians believe that having falooda seeds with milk, keeps the body cool and is an excellent remedy for acidity. Try using the seeds in your porridge or cereal. It will keep you full till lunch time or beyond. As per the instructions on the packet prepare the jelly. Put it in a tray to set as you need a thin layer. I usually use a steel plate. Soak the falooda seeds in 2 cups of water and leave till required. Boil about 2 cups of water. Add the thin vermicelli to it and boil for 3to 5 minutes or till the vermicelli is cooked. Drain out into a sieve. Wash under cold water. Leave it in the sieve till required. To make the falooda, take 12 tall glasses. Put in each glass a teaspoon of rose syrup. Cut the jelly into tiny cubes. Divide it between 12 glasses. Drain out the falooda seeds into a sieve. Spoon the seeds equally into 12 glasses. At this stage if the vermicelli is sticking, just run it under cold water. Divide it between 12 glasses. Put into each glass about ½ a cup of cold milk. Serve each glass with a straw and spoon. If you want to serve falooda for a party, prepare the seeds, vermicelli and jelly a day ahead and leave it in the fridge in till required. Replace the rose syrup with kesar syrup. Then you may want to make yellow jelly. Use indian jelly if you want it gelatine free. But it does become watery once it is left for a while outside.Use less water then the required amount. To make fig falooda, soak dry figs in a cup of milk. Then heat it up till it melts. Cool the mixture and add it the required amount of milk for the falooda. I have not added sugar. If you need to then add it to the milk. I usually like to slowly pour the rose syrup after I have added the milk. This way when you serve it to the guests, it appears white with streaks of pink. They can mix it themselves.